With the safety of residents at stake, Memory Care homes require architects who are fully aware of the unique challenges of designing for our elders living with dementia or Alzheimer’s. Health Facilities Group understands that this population retains its right to stimulation and fulfillment while under the care of others. By designing for WanderGuard technology, HFG ensured that the safety of entrances and exits could be secured unobtrusively, so as to avoid visual reminders of limitation. The floorplans of the Glen Carr Houses also attract residents inwards to centrally located living rooms that utilize interior finishes reminiscent of the intimacy of a private home. From the overall layout of these homes to the details of their interior design, HFG designed the Glen Carr Homes to preserve the dignity, autonomy, and engagement of our elders in need of Memory Care. The three Glen Carr Houses in Derby, KS are intimate environments which provide rooms and a shared living room for 12 elders per house. 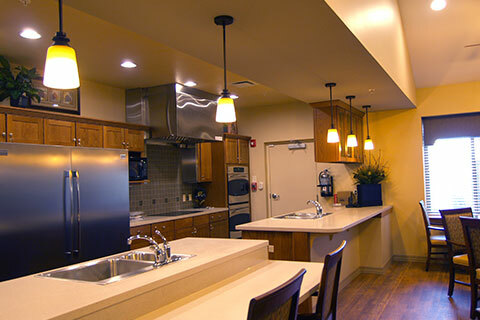 These Memory Care residences are based on a neighborhood model and incorporate cutting-edge technologies to engage memory, increase participation in activities, foster interaction between residents, and enhance overall health. The intimacy of these homes is inspired by lessons learned while designing for the Green House Project. To guarantee resident safety, the houses feature WanderGuard security technology at all points of egress. Once completed, the campus will include 6 houses.